Randall Streufert of Gypsum examines on of the displays at the Hardscrabble Ranch Community Open House Thursday night. A second session is planned Wednesday, May 23, from 5 to 7 at the Brush Creek Pavilion in Eagle. When: 5 to 7 p.m. Wednesday, May 23. Where: Brush Creek Pavilion, 909 Capitol St., Eagle. More information: Community members will learn about the 1,540-acre Hardscrabble Ranch open space parcel and can offer comment about future uses for the land. For those unable to attend the open house events, public comments can also be submitted online at bit.ly/hardscrabblecomments. Information on Hardscrabble Ranch Open Space and the management planning process can be found at www.eaglecounty.us/openspace/hardscrabble_ranch/overview. For additional details, contact Diane Mauriello, Eagle County open space manager, at 970-328-8698 or diane.mauriello@eaglecounty.us. EAGLE — As he studied the various maps that provided details about Eagle County’s latest open space land purchase, Randall Streufert, of Gypsum, saw potential for great recreation opportunities and potential for user conflicts at the Hardscrabble Ranch property. Jennifer Griffis, of Eagle, wasn’t as concerned about accessing the Hardscrabble Ranch property as preserving it. “I love that this will be open space. I hate to see everything developed,” she said. “I like looking at it. I don’t really need to go on it.” Those comments demonstrated the challenges ahead as land planning proceeds for the Hardscrabble Ranch property. The first community open house for the property was held Thursday night, May 17, in Eagle. After reaching out to various user groups to learn about proposed uses for the property, Eagle County planned two community sessions — one held this week and a second one planned Wednesday, May 23 — to let all area residents weigh in on the property plan. A couple dozen locals participated in the first session. Eagle County acquired the 1,540-acre Hardscrabble Ranch, formerly known as the Adam’s Rib Ranch Headquarters property, in December 2017 for $15.5 million. The purchase was made possible through a number of funding partnerships, including the town of Eagle, Eagle Ranch Wildlife Committee, Great Outdoors Colorado, the Eagle Valley Land Trust and a number of private donors. A comprehensive plan for the property is currently being developed, which is the reason for the community open house events. “We know people are very interested and want to get access to the land, but we want to be thoughtful about this plan and get it right,” said Diane Mauriello, Eagle County open space manager. She noted that getting it right means considering agriculture management, recreational opportunities and scenic and historic values for the land. The county has retained ERO Resources, a land-planning group that headed up a similar project in the Gunnison area, and local firm Take Aim Marketing to assist with the planning effort. Bill Mangle, of ERO Resources, told the community open house participants that planning for Hardscrabble Ranch’s future is about two months into a nine-month process. “We really want to make sure this is something this community will be proud of for a long time,” Mangle said. The county hopes to have a first draft of the Hardscrabble Ranch management plan completed by this fall. That draft will then be vetted during a series of community meetings. The county, along with the Eagle Valley Land Trust as the entity that holds the conservation easement on the property, hopes to adopt the final management plan by December of this year. Users are reminded to keep dogs on a leash at all times while on the Hardscrabble Ranch property. The ranch headquarters and working ranch property, as well as fishing on Brush Creek accessed via Brush Creek Road, remain closed to the public. 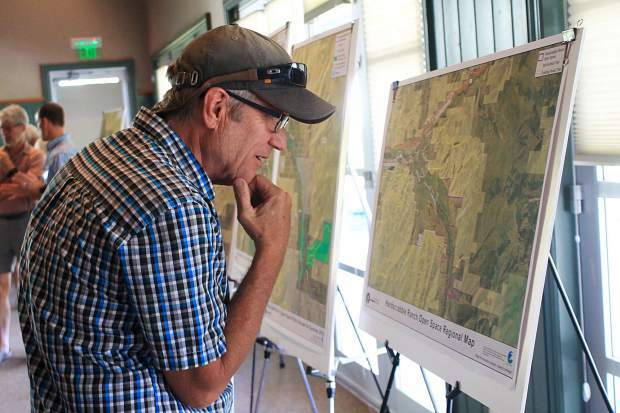 Even as they weighed in on ideas for the Hardscrabble Ranch plan, participants at Thursday’s meeting learned that moniker is one of the issues up for debate. According to Amy Cassidy, of Take Aim Marketing, the name “Hardscrabble Ranch” isn’t very geographically or historically accurate. What’s more, its a bit confusing because there is another Hardscrabble Ranch in the Gypsum Creek Valley. Cassidy noted when they weigh in on plans for the land, community members will also have the opportunity to offer name suggestions. For long-time Brush Creek residents, there’s less concern about what the property is called than contentment that the land won’t be developed. “I love looking out there, seeing the cattle and knowing they will always be there,” said Brush Creek resident Rosie Shearwood. Resident Charlie Ridgway said he never thought he would see the day when his property would be surrounded by open space. “I figured the valley’s expanding growth, sooner or later, would overrun us. But that’s not going to happen,” Ridgway said.